Bossa Nova's scalable inventory data services represent the best in class for retail robotics, data analytics, software infrastructure, and field operations. Our technology automates the collection of high-resolution product data, extracts actionable information in real time, and delivers prioritized tasks to your team. The result? Improved operational efficiency, reduced operational costs, and most importantly, increased customer satisfaction. Our experienced team works with you to build a custom strategy proven to integrate with many, if not all, of your existing systems to completely maximize your operational benefits. We are strengthened by our extensive retail experience, technology integration expertise, and critical field involvement. When our robot "wheels" into your stores, we guarantee you'll save intensive labor hours, increase sales, and improve overall store conditions with unmatched accuracy. Access and assess data generated by the robot, for any mission to ensure its completeness and accuracy. See all the data generated over time, across your stores to discover trends and anomalies. Be confident that no one else can access your data. Access reports at a time and place that is convenient for you. You can export data for further analysis. There’s no need for special tools. Our data will be available to you via a web browser or application installed on your devices. Leave it to us to manage the setup, monitoring, and maintenance of the robot and your secured data. The Bossa Nova robot was built with safety in mind. It is extremely robust, with a tamper-resistant skin, and is guided by cutting edge self-driving technology from Carnegie Mellon University. A battery of 3D sensors creates a safety canopy all around the robot to detect an avoid obstacles big and small. With over 14,000KM of autonomous driving around shoppers, it has never collided with anyone or anything. You can have full trust in the robot navigating on its own among your shoppers and associates. Our robot is completely autonomous. It requires no human intervention to undock on schedule, plan and execute an effiecient scanning path down the aisles, capture and process data, and return home to recharge while wirelessly transmitting the data to the cloud. Our combination of onboard and cloud computing optimises data delivery time in accordance with your SLA. Our computing architecture is built to withstand network disruptions. You can confidently rely on our data to run the store. Our locked-down hardware and robust software security system provide the best in class protection of your data and network - on the robot itself, in the cloud, and for data transport in between. The cloud processes the data using the latest advances in Artificial Intelligence (AI) developed in collaboration with Carnegie Mellon University. 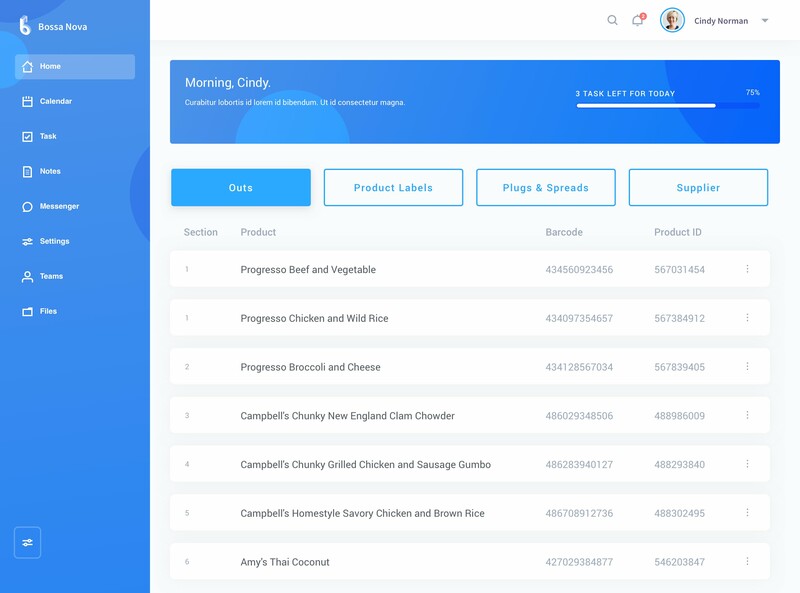 AI algorithms detect and recognize everything on the shelf, from the structure of the fixture, to individual product facings and price labels. This information is then turned into data products such as out-of-stocks and delivered to your back-end system as fast as the robot scans. Your associates will be able to take corrective action as soon as issues are detected. The Bossa Nova team will manage the setup, monitoring and maintenance of the robot so that your associates can focus on what they do best. With 24-hour live monitoring and incident alerts, you’ll always know how the robot is doing in your store. Trained technicians also perform preventative and responsive maintenance during the life of the robot. We can also provide outreach and orientation materials for associates and customers if requested.